Sand Dune Safaris operate out of the beautiful seaside paradise of Port Stephens, NSW. They offer a number of adventure tours on the largest moving sand dunes in the Southern Hemisphere. Ride in their comfortable purpose built off road vehicles. They are a small family run business who pride themselves on their personal service. Their tours are designed for the whole family and are suitable for all ages and abilities. 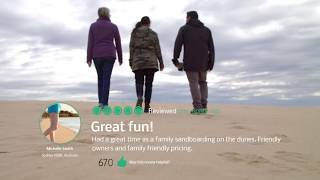 Highlights include sand boarding (sit down style), sand surfing (stand up), the hidden outpost of Tin City, digging for pippis and visiting Aboriginal cultural and World War Two sites. Or you can design your own adventure. Sand Dune Safaris provide shade, tables and chairs at their Sand Boarding location, and you can stay and play as long as like! An instructor shows you the safe method for both sit down and stand up styles, and supervision is provided for the length of your stay. There is a shuttle bus every 15 minutes, when you wish to go back to the car park simply hop on the next bus. The departure location is the lower car park at the end of James Paterson Street Anna Bay.